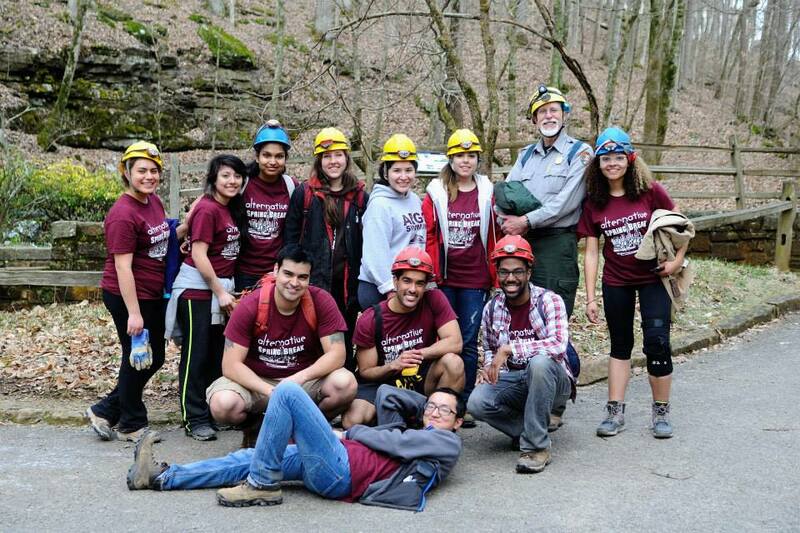 Alternative Spring Break: Mammoth Cave Restoration! This was the group I worked with during my spring break. It is with the University of Illinois Alternative Spring Break Organization. Easily one of the best experiences I’ve ever had! The amount of team work and camaraderie was perfect! I’d like to believe that great team work is why we were given plenty of time with our coordinator to explore so much of the mammoth caves; including the Hidden River and Echo River Caves. Each of these individuals were such a joy to be around, and work with. Well, let me tell you a little more about the experience! After this pic! Rick, our guide, and the entire Alternative Spring Break: Cave Restoration Spring 2014 Team. First Row (left to right): Paloma, Jasmine, Abhi, Lauren, Ari, Valeria, Rick, Cai. Second Row (left to right): Dan (me), Arjun, Morris. Finally: Justin (Our team mate and awesome camera man). The first day was a series of touring, scavenging for food and getting settled into our living spaces. Our drive over was approximately 6 hours long. We arrived at the Mammoth Caves tour HQ and, obviously, rushed to the bathroom! Shortly after that, we were to meet with our trip coordinator, Peggy. This meant one thing… most of us did not get breakfast! And since we drove straight to the Tourist Center, we didn’t have lunch either. So, a few of the other guys and I were hunting down a vending machine, or some other form of sustenance. We did find a vending machine and food place, but needed our wallets! Most of us packed them into our backpacks, haha. Finally, we walked to the vending machines, where a short time after our coordinator called us to wait for her in the main Tourist Center. Ahh… so close. We would’ve preferred a decent meal, but a Honey Bun, some Chips and a soda is what most of us purchased. There was a little diner there, but we didn’t have enough time for a full meal. This mean the 2 hour tour inside the caves consisted of us looking for a KFC, or Starbucks at every corner! It was a really nice tour though, and that is where we first met our tour guide Rick. We finally ended up going to an Applebee’s, and ordered a bit too much! Haha, the eyes were too big for our stomachs… well, at least mine were. After our glorious meal we ended up in Walmart to shop for some of our weekly necessities. While purchasing, we did not take into account how tired we would be most nights! Haha, this will come into play in a few paragraphs. Our third day was the first day working inside of the caves. We headed into some of the previously unexplored parts of Mammoth Cave, and were put to some hard labor! Our task for the day was to collect pre-organized rubble from one room and move it into another room (the previously designated ladies rest room). Seems like a simple enough task, except that the rooms were not near each-other, nor was there a direct path. We placed the rubble into plastic trash bags, then carried them like little babies! Well, that’s what we initially did, before realizing it was much easier to swing them on our backs! The route was… hmm.. how to describe. Let’s start with the location of the pre-organized rubble. From there, it was around 70 yards to the first set of stairs, which had a little overhead needing to be ducked by some of us taller folks. Once you reached the bottom of the stairs, it was a bit of a low ceiling, so a little crouching was in order, the all clear to the bottom of the next set os stairs about 30 yards away. Then we reached another stair case, with… at least twice as many stairs as the previous one, and a few more overheads. This lead to a short walk from the top of the stairs to the former ladies room. Here is where we started piling the bagged rubble. This was definitely the hardest day, in terms of labor. We managed to move around 2.5 tons of rubble! I sparsely remember the end of that day, but I’m certain we were barely able to do much this evening, haha. We did manage to make a decent meal! Some quesadillas and fries! The fifth day was one of many glories! The morning for instance held one of the most wonderful experiences we could have dreamed of! For the first time, everyone of us took a shower at the same time! Glory be to the great shower head gods! From then on, the day only got better. Not to say it wasn’t hard work, far from it, but it was such a beautiful day in Kentucky! And we worked outside all day! We were tasked with clearing out an old community cemetery that was overrun by fallen and dead trees, a number of nasty little vines and plenty of branches! Ahh, there was that mid-day sun shine, a nice cool breeze–perfect for some hard work–, a nice soft woody scent, nice ambient sounds, and great scenery! There was a watering hole for the cows a few yards away; the cows even came over to drink while we were working! And green everywhere! This was they day the let us out a bit early, and head to Knoxville, TN! We did some exploring, ate some ice cream (well.. I had the cappuccino since the place said it was their best… it was decent) visited an art museum (free to students), and ate at the Hard Rock Cafe! A good night if you ask me! Our sixth and final day consisted of an early morning! We were off to do a radio show and be on live TV–yeah we’re big shots ;). Then take another shot at those rocks of rubble with Rick! (yes, that triple rrr was intentional) This time, we had a plan! And our awesome team work! We created a chain, and stock piled backs! It was fun and efficient! Which meant one thing! More time to explore the caves! And, this was indeed the case, though, I’m sure most of us wanted to get out of the caves and into some fresh air by this time, I believe we all enjoyed those extra explorations. So many amazing formations, and interesting tidbits of history. This was a much easier caving day than our Wednesday surveying! And probably one of the reasons it was more enjoyable, hahaha. A long day, and a lot of work! Which means! A lot of pizza! Our coordinator, Peggy, was treating us to a pizza party at Turtlelini’s Pizza and Pasta. The owner was pretty awesome, we were only getting 4 pizzas and drinks, when he decided to upgrade us to infinite drinks and access to their buffet! He also kept the pizzas coming for us! Haha, such an awesome place. And of course, one more shower! The seventh and final day there was bitter sweet, as most of the last of anythings are. We were treated to a wonderful breakfast from our housing host, Pastor Dave. He and his group of guys treated us to delicious eggs, bacon, pie, bacon, sausages and bacon! It was a great breakfast with great company. Fortune would have it, this day was also Peggy’s birthday! We never really found out her age, but we guessed 29, haha. We gave her a little cookie cake, and hopefully some good memories! We also departed, leaving behind some thank you cards to all of those wonderful people we met along our trip. Of course, we still had to separate as a group, haha. Our 6 hour drive consisted of the usual napping, well the passengers; we hope not the drivers :P. A pit stop here, and before long we were back in Chicago! So, we started splitting off, perhaps not entirely processing the events. It’s hard to believe you can get so close to a group in such a short time, but this is proof that it can happen. And, as we part ways, I know we’ll still see each-other’s Facebook and Instagram feeds, and hand out an occasional like. Haha, but I do hope we get to hang out from time to time! It’s been great working with you guys, and if we don’t hang out again, I wish you all a great journey! You’re now job hunting! What you need to know about recruiters, and how to benefit from them!